1. Combine the yogurt with the mint in a small bowl. Heat 1 tsp of the oil in a saucepan and gently fry the onion and carrots for 5 minutes to soften. Stir in the lentils, berbere spice, half the coriander and a dash of water to moisten. Cook very gently for 5 minutes. 2. In a separate pan, heat the remaining oil and fry the tomatoes for 2 minutes. Drizzle in the honey and cook for a further 1-2 minutes until the tomatoes are lightly charred but retain their shape. 3. 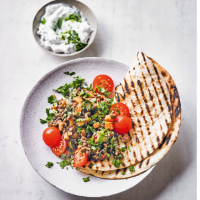 Spoon the lentils onto serving plates, top with the tomatoes, yogurt and remaining coriander. Delicious served with warmed flatbreads.